I was upset yet intrigued by this report last week in the Financial Times. Elica Tozawa has devoted seven years to her modest school for Brazilian migrants in the rural Japanese town of Oizumi, north-west of Tokyo, labouring with her seven teachers to clean up donated shipping containers for use as classrooms. Now Ms Tozawa is having to watch as Japan’s worst economic downturn in decades empties those classrooms of some of their brightest talent because parents laid off by local factories cannot pay her Y25,000 ($273, €213, £191) monthly fees. “Children who can’t afford to study here any more come to see me after school in floods of tears because they want to study. It’s so unsettling for them,” she says, sitting in her chilly container office amid trophies won by her school’s football teams. The plight of Ms Tozawa’s pupils, the descendants of Japanese people who emigrated to Brazil, underscores the widening distress being suffered by some of Japan’s most vulnerable groups amid its worst downturn in decades. Brazilians flocked to Japan in the early 1990s, after Tokyo began giving immigrants of Japanese descent three-year renewable work visas. For such “Nikkei Brazilians” – the first of whose forebears sailed on the Kasato Maru to Brazil in 1908 in search of a new life – the return voyage offered a hope of prosperity unattainable at home. Brazilians account for about a fifth of Japan’s 486,000 foreign workers but the precarious place they have established in their ancestral homeland is now threatened. “It’s frightening how something like this community, that has taken years to establish, can just disintegrate so rapidly over a few months,” says Arnaldo Shiowaki, general manager of the Oizumi branch of Alfainter, a travel agency. Mr Shiowaki says that those migrants who can afford to leave Japan are doing so, and fast – 94 per cent of the tickets he sells to Brazil these days are one-way. Routes that do not require transit visas are sold out until April. The departures threaten to have a devastating effect on the local economy of Oizumi, which had a foreign population of 16 per cent before the crisis. Those residents spent money that will be missed by vendors of everything from daily necessities to electronic goods. “There was even a mini housing boom here until this [downturn] happened,” Mr Shiowaki said. Saremi Asghar, an Iranian long-term resident of Oizumi and second-hand car dealer, says the impact of the downturn is already obvious, gazing out of his office at the town’s deserted main street at the shuttered tattoo parlour opposite. “A few months ago, I’d look outside my window and at this time there would always be people chatting in the streets,” Mr Asghar says. He also says that prices of second-hand cars at auction are falling steeply. Ms Tozawa fears that the downturn will have a long-lasting human cost. Her school aims to ensure that pupils are bilingual in Japanese and Portuguese by the time they graduate, allowing them to win places in university and to integrate into both Japanese and Brazilian societies. “This was a crucial year. My first students were about to enter their final year of high school and the top ones were set for universities and colleges . . . that has now been thrown into question,” she says. Some migrants are in even more desperate straits: homelessness is growing among the newly unemployed, residents say. “A 23-year-old single mother with three children turned up recently and had nowhere to stay,” Ms Tozawa explains, adding she had arrived from Aichi prefecture, a manufacturing hub where companies including Toyota are based. So I decided to go and check out Oizumi for myself at the weekend. It nestles, if anything with such a relentlessly flat topography can be said to nestle, just across the border from Saitama in Gunma Prefecture, indeed it’s less than an hour from my beloved Kawagoe. It’s tricky to get to on any measure, though: peel off the Kan-Etsu Expressway and you have to wade through a good half-hour of urban sprawl before you reach its shores, and the only other way in is via a two-carriage train on the tiny Tobu Oizumi line, which runs for six stations and 13km out of one of the nearest largish towns, Tatebayashi, and terminates at Nishi Oizumi. If a town’s prestige in Japan can be said to be determined by its rail links, then Oizumi is near the bottom rung of the ladder. The way in I took, off the Kan-Etsu and via the outskirts of the northern Saitama city of Kumagaya, was the usual endless suburban Japanese strip of car dealerships, family restaurant chains, supermarkets, and DIY emporia, and only to the alert eye were the first signs of trouble ahead – second-hand car lots with row after row of vehicles at around GBP1,000, udon and soba chain outlets where yer bowl of carbs costs around two quid, ones like this on the outskirts of Oizumi. Entering Oizumi, I was fortunate, as I had no detailed map, to make directly for Nishi Oizumi station, which is what was once the hub of the battered town. Parking up within 150m of the station cost nothing, and clearly would have cost nothing at any point in the week, which in Japan – as in many countries – is a worrying sign for the inner economist. I was shocked on reaching the station: I don’t think I’ve seen a more devastated front-of-station shotengai (shopping street) anywhere in Japan. It was almost as though a neutron bomb to wipe out people not buildings, equipped also with a secret device for bringing down aluminium shutters in front of buildings, had hit. Admittedly it was Sunday, but it was obvious that much of what was shut wasn’t about to reopen the next day. There wasn’t even a convenience store, which is again a barometer of how bad things are. Within a 200m radius of the station there was one nationwide chain, a purveyor of sickly sweet cakes called Fujiya, which itself is in big trouble and has been for many years. What there were instead were marginal Brazilian groceries such as this one. Slightly further out from the station you come across a handful of buildings that have been improvised into Catholic churches and community centers, such as this one, though my scepticism runs deep about how much multiculturality is going on in Oizumi, particularly on the part of the host nationals. This is the back of the Nishi Oizumi terminus, looking almost British in its forlorn end-of-the-line, seen-better-days-ness. Chastened somehow, I headed for a late lunch at a churrasco place not far from the station. And immediately my spirits lifted; all the patrons were Brazilian, some looking more Nikkeijin than others, and as you can tell from the car park, not everyone in the town is on their uppers. Stepping inside was like being transported to an easy Sunday afternoon in Minas Gerais, and completely delightful – the bebes were kissed, the churrasco was cut theatrically at the tables, peals of laughter rang the air, groups of factory workers kicked back over rum baba-like confections from the all-you-can-eat buffet, and best of all (to the inner economist), prices were pretty steep – Y3,000 for the churrasco… I settled for feijoada and admired the authenticity while discarding the chucks of “buta no iro iro” (bits of pig) that I couldn’t immediately identify. Mein host was Eduardo, and such a refreshing change from the standoffish service you generally receive in Japanese restaurants he made too. His English was limited, as was has Japanese, and my Portuguese is non-existent, so conversation was difficult, but we did manage to establish that, since leaving Brazil, he had worked in Spain and Germany and had been in Japan about 18 months. How did he find Japan, I asked. “It’s very different” he answered diplomatically. So why are the Brazilians packing for ‘Paolo? Well, Oizumi has only two main sources of reasonably well-paid jobs, one of which is this. The Subaru Oizumi plant is vast, supplying engines and powertrains to sister factories nearby in southern Gunma. This is one of the four Subaru plants of any size on the planet, with three being in Gunma, where Fuji Heavy Industries was born as the Nakajima Aircraft Company before World War II. While Subaru hasn’t been as badly affected by the global collapse in car demand as some, production this quarter is forecast by the company to be down 36% YoY. And as was apparent from the vast lot out the back, only a fraction of which I managed to sneak on camera through the barbed wire and well-padded trees, there is an inventory problem afoot. Oizumi’s other problem is the Sanyo plant. Sanyo is in its last few months as an independent company, before it is taken over by Panasonic, and the future of the plant must be uncertain, to say the least. Here’s where at least some of the luckier Fuji Heavy employees get to live. Check the just visible Subaru logo on the wall of the right-hand building. Where do they hang the washing? Almost every car in the car park is a Scoobie, many nearly new. I suspect these flats are grace-and-favour ones for the full-time employees (i.e., not the Brazilians). Certainly there was a heavy Brazilian presence in some tumbledown tenements further out of town that make the Subaru accommodation look like a workers’ paradise. Oizumi is an utterly fascinating place, trapped as it is on the fault lines of the tectonic plates of globalization. I’ll be back. I’d like to thank all the Brazilians from Oizumi and elsewhere who’ve accessed this page over the last year and made it consistently the most popular page on the website. Muito obrigado. I’ll be back in early 2010 to see how everything’s going. oh.. i passed thru this Sanyo’s facility gate so many times…. is far too long. On my rather weak breadband (hey!) here, it is not possible to get beyond a certain point. The images don’t come down. You should break it up into more digestible lumps. At the moment it is “249 items remaining” and it isn’t getting better quickly. Point taken. Like Topsy, the site just grew, and the basic blogging toolkit I am using is far from sophisticated. Next time will be different. 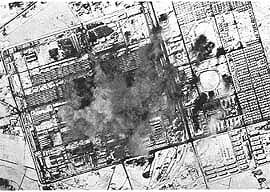 The Sanyo factory could be the location of a Nakajima aircraft factory that was bombed by B-29s on April 3, 1945. 2. The slanted road on the upper left edge of the photo matches the route of 354. I wish I’d known that when I was there. From fighters and bombers to compressors, washing machines, cogeneration equipment, and who knows what came out of those Sanyo gates.